Anyone who has worked in theater knows full well that the performance environment is driven by a constant injection of hyper-adrenaline & creative hysteria. This is the active substance for those who thrive on conflict as a constructed realm of the imaginary via the suspension of disbelief. Conflict is the life blood of theater, without it, there is nothing: no engagement, no story, no catharsis. To keep the narrative boiling at peak fever, every aspect of the production, from its conception to its performance, is driven by the need for crisis as a state of constant emergency. And so we come to the TRUMP Show, the reality-bending, all-encompassing Act of 24/7 always-on performance art, which thrives on the constant invention of crisis to keep the Media and all of the rest of us in a continuous mode of breaking news alerts. Just when we thought we had reached the upper threshold of madness brought on by governing through simulation, the Wall, already the mother of all simulacrums that would bring Baudrillard to his knees weeping with joy and horror, has emerged as the ultimate, made-for-tv, epic emergency that lo and behold is the idealized crisis to propel the TRUMP show forward into new, riveting, unconstitutional narrative territory. Homeland Security has already built TRUMP’s Wall Showroom at the Border of Sanity just south of San Diego, not too far from Hollywood where stage sets like this are an everyday sight. It is here at the Border that the sheer beauty and craftsmanship of Wall design is taking shape, from classic to contemporary, modeling the perfect “look” that will scare away gangs, murderers, and rapists back from wherever they came. 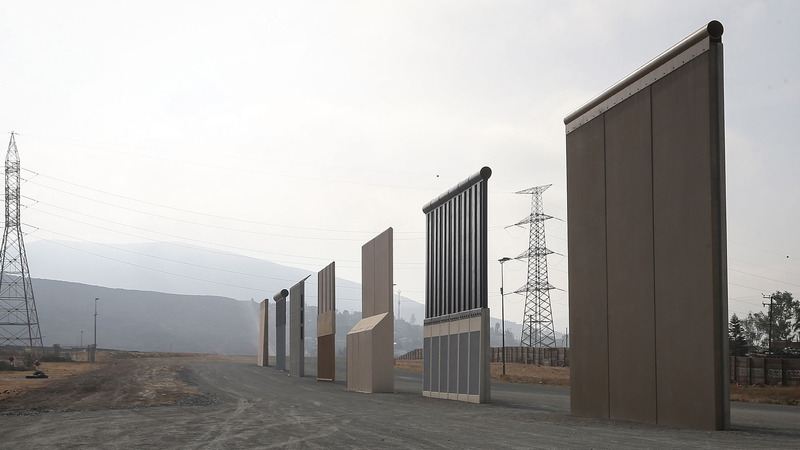 But if you take a closer look, you will see, that in fact, these Wall prototypes are far too aesthetic to serve as a scare tactic, rather, they may as well be the front gate for one of TRUMP’s country clubs: elegant, refined, sleek barriers intended to keep the wealthy protected from the slovenly and needy. Ultimately, yesterday’s “National Emergency” has been deviously crafted to pump up the self-glorifying narrative to Make TRUMP Great Again. You have to grudgingly give TRUMP credit: Hollywood script writers would be hard pressed to beat the sheer audacity and over the top constitution-crushing lunacy of this TRUMPological “National Emergency,” which has so brazenly deconstructed the Administrative State through the age-old power of pure and total theater conflict.